New open-air member of the AMG GT family – Mercedes AMG GT S Roadster. 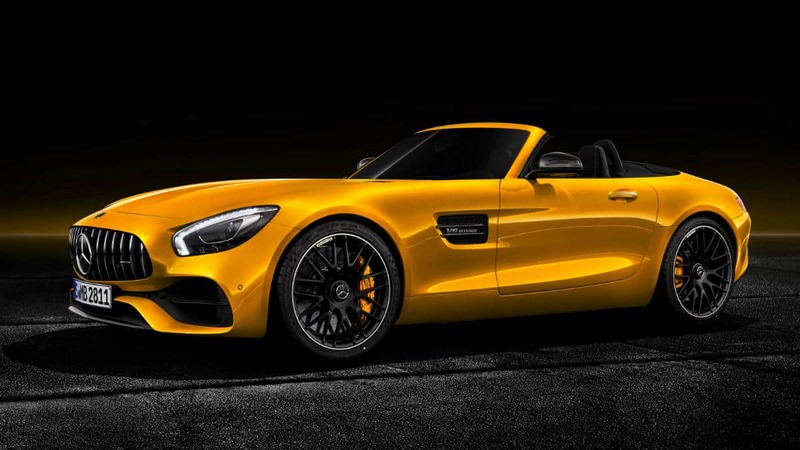 Mercedes-AMG is extending its sports car portfolio with the new Mercedes AMG GT S Roadster. With this latest addition the AMG GT family now has a dozen members: four two-door Coupes, three Roadsters, two customer sports racing cars and three four-door Coupes. 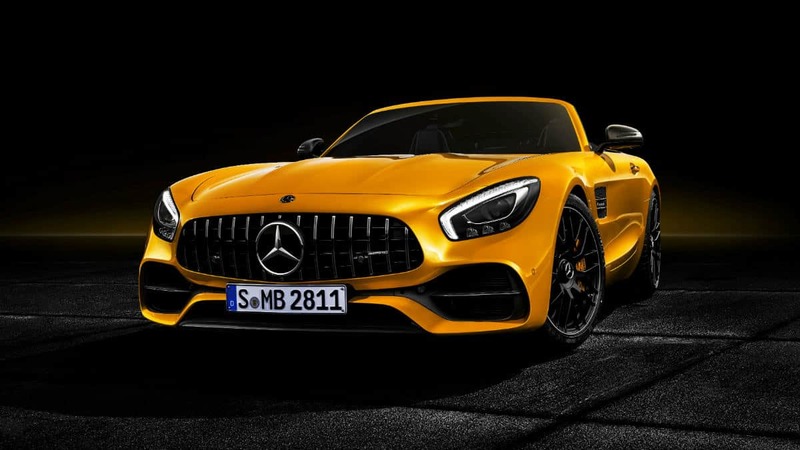 The basis for the high Driving Performance of the new AMG GT S Roadster is the combination of a lightweight aluminum spaceframe, a V8 bi-turbo engine, a seven-speed dual clutch transmission, a rear axle locking differential and a sports suspension with aluminum double wishbone axles. Compared to the Mercedes AMG GT Roadster, the Mercedes AMG GT S Roadster is rendered even more dynamic by numerous modifications to the engine, suspension, brakes, design and interior. 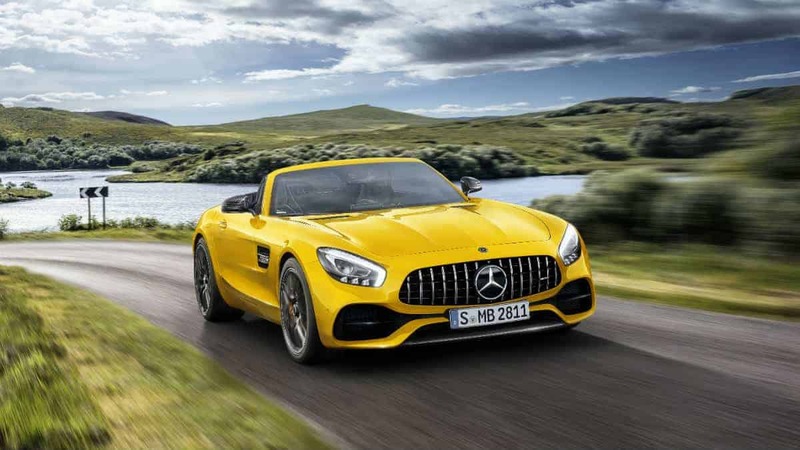 This positions it between the AMG GT Roadster and the even more powerful AMG GT C Roadster, now providing a choice of three open-top two-seaters. The AMG 4.0-litre V8 bi-turbo in the Mercedes AMG GT S Roadster delivers an output of 384 kW (522 hp) and maximum torque of 670 Nm. This is available over a wide engine speed range from 1900 to 5000 rpm. The eight-cylinder power unit delivers muscular performance in all engine speed ranges, combined with high efficiency for low fuel consumption and emission levels. A sprint from standstill to 100 km/h is absolved in 3.8 seconds. The dynamic power delivery continues right up to the top speed of 308 km/h. The two turbochargers of the V8 are not positioned on the outside of the cylinder banks, but inside the cylinder “V”. Advantages: a compact engine design, spontaneous response of the turbochargers and low exhaust emissions thanks to optimal airflow to the near-engine catalysts. The dry sump lubrication also ensures the oil supply even with high lateral forces and allows the engine to be installed lower, thus moving the centre of gravity closer to the road and forming the basis for high lateral acceleration. Power transfer is based on the combination of a front mid-engine and the AMG SPEEDSHIFT DCT 7G sport transmission in a transaxle arrangement, combined with a torsionally rigid torque tube. Thanks to the wide gear ratio spread, the decidedly high torque of the V8 biturbo engine can be used to optimum effect. The weight distribution is also ideal for optimum driving dynamics at 47 (front) and 53 (rear) percent. Rear-axle limited-slip differential Mechanical Electronically controlled Electronically controlled. 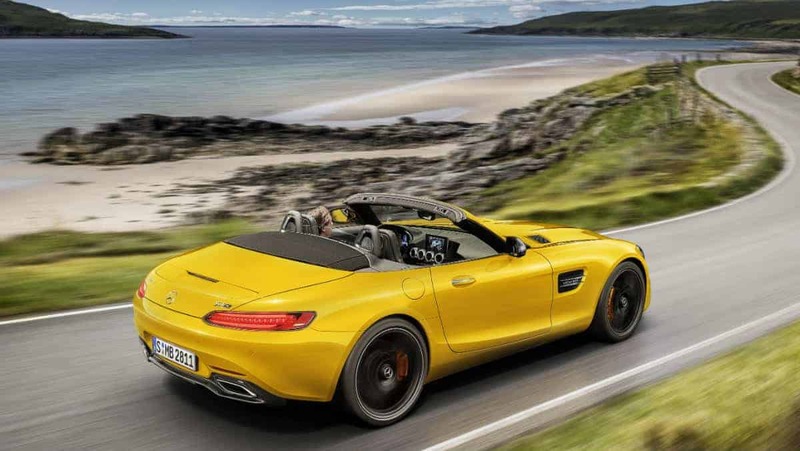 The AMG GT S Roadster is equipped with the AMG RIDE CONTROL suspension with adaptive damping adjustment as standard. This fully automatic, electronically controlled system adjusts the damping at each wheel to the current requirements. This improves driving safety and ride comfort. The damping is adjusted individually for each wheel and depends on the driving style, the road surface and the selected suspension setting. The ideal operating point can be selected at all times on the basis of extensive information relating to acceleration or vehicle speed, for example. Using a switch in the centre console or by selecting the drive mode, the driver is able to choose between the different damping characteristic maps “Comfort”, “Sport” and “Sport+”, and can thereby individually influence the driving experience. The driver is able to set the Mercedes AMG GT Roadster to his/her individual requirements using the AMG DYNAMIC SELECT controller. Five drive modes, “C” (Comfort), “S” (Sport), “S+” (Sport Plus), “RACE” and the individually programmable setup “I” (Individual) are available. These allow a broad range of driving experiences – from comfortable to very sporty. In all modes, key parameters such as the response of the engine and transmission, the accelerator characteristics, das AMG RIDE CONTROL sports suspension, the steering, the 3-stage ESP® and the position of the AMG Performance exhaust flaps are modified. By pressing the separate “M” button in the center console, the driver can activate the manual transmission mode in any drive mode to change gear using the steering-wheel shift paddles. The suspension set-ups can also be selected specifically as needed. 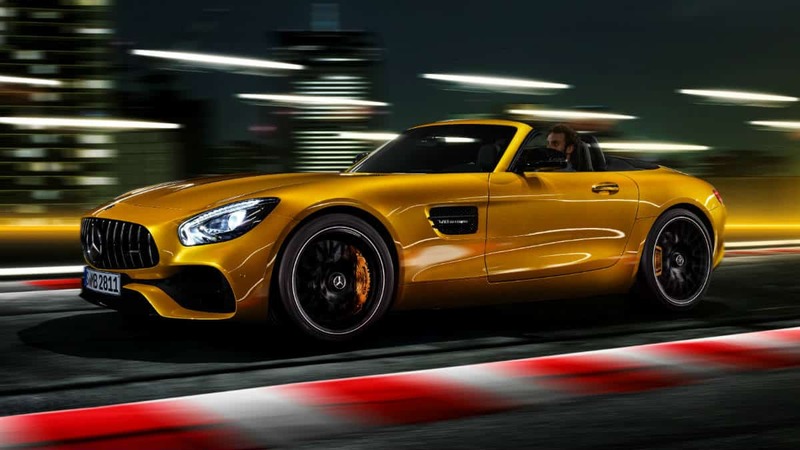 As standard, the Mercedes AMG GT Roadster is equipped with an electronically controlled locking differential at the rear axle, which is integrated into the compact transmission housing. Its sensitive and fast control raises the critical limit of vehicle dynamics to a new level. It not only further improves the traction of the drive wheels, but also increases the critical cornering speed. The result is that the driver is able to accelerate out of corners earlier and with more power thanks to the improved traction. The vehicle remains more stable when braking from high speed, while the limited-slip differential also improves traction from rest. The greatest benefit of the electronic rear-axle limited-slip differential is the even more sensitive and proactive control, which pushes the critical threshold higher, making it even easier to drive at the vehicle’s limits. To deliver optimum cooling, the housing of the limited-slip differential has additional cooling fins. 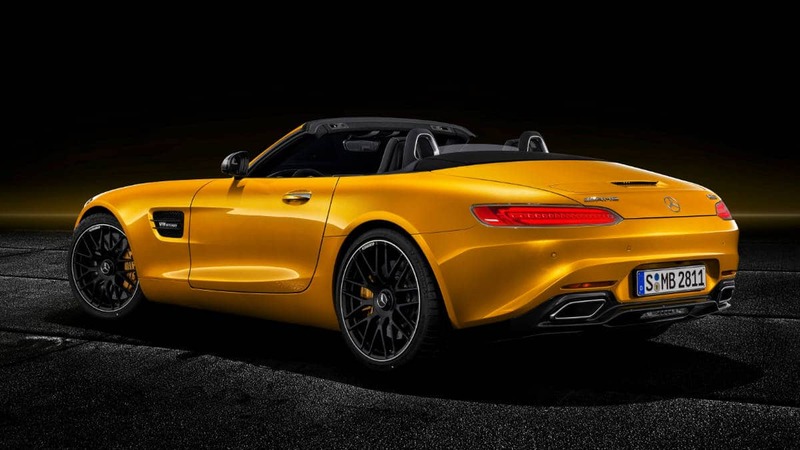 The AMG high-performance composite brake system is adapted to the enhanced performance of the AMG GT S Roadster. The front axle features composite brake discs measuring 390 x 36 mm with 6-piston fixed callipers, with composite brake discs measuring 360 x 26 mm and single-piston fixed callipers at the rear. The brake calipers are painted in red with “AMG” lettering. There is also the option of the AMG high-performance ceramic composite braking system with brake discs in size 402 x 39 mm at the front axle and 360 x 32 mm at the rear, together with specially painted brake calipers with “AMG Carbon Ceramic” lettering. Exceptionally short stopping distances, a precise pressure point and outstanding resistance to fading even under extreme operating conditions – the AMG high-performance ceramic composite braking system offers motorsport-like braking performance and weighs around 40 percent less than with conventional composite brake discs. For the body of the Mercedes AMG GT Roadster, a producer has opted for an intelligent and particularly lightweight mix of materials with a high proportion of aluminum. The spaceframe and exterior parts are of aluminium, and the boot lid too is particularly light in weight thanks to an innovative composite material. The load-bearing structure is of SMC (Sheet Moulding Compound). These high-tech plastics excel with their lightweight design, high strength and outstanding surface quality. The innovative materials were developed by the Mercedes-Benz TEC factory in Sindelfingen, and brought to production maturity together with the AMG specialists in Affalterbach. The extremely lightweight front deck made of magnesium reduces the inertia ahead of the front axle, improving the agility of the Roadster. The three-layered fabric soft top is supported by a magnesium/steel/ aluminum structure of low weight, which helps to keep the vehicle’s center of gravity low. Additional roll-over protection is provided by an integrated aluminium cross-member, while the inserted acoustic mat improves noise comfort. From the expressive AMG radiator grille to the long bonnet and the muscular tail end, the two-seater guarantees a pure sports car experience even when stationary. The flat front section and forward-sloping radiator grille make the Roadster appear to hug the road. At the same time this shape lowers the vehicle’s back-pressure point, enhancing the flow of cooling air and the car‘s aerodynamic performance. The front apron in jet wing design emphasises the car‘s width, making it sit flatter on the road. The large outer air inlets guarantee the supply of cooling air to the engine. The LED High Performance headlamps offer more safety at night and an unmistakably sporty and distinctive look. Thanks to LED technology, they illuminate the road more effectively than conventional headlamps – with lower energy consumption. The active air regulation system AIRPANEL included as standard is a particular technical highlight. Vertical louvers at the bottom of the front apron are opened and closed electronically by means of an electric motor in around one second to guarantee the required amount of cooling. Constantly achieving the ideal position calls for highly intelligent and fast control. During normal driving with no increased cooling demand, the louvers are closed for reduced drag and the air is directed at the underbody. This improves the aerodynamic efficiency of the vehicles. Only when certain components reach predefined temperatures and the air demand is particularly high do the louvers open to allow the maximum cooling air flow to the heat exchangers. As another active aerodynamic component, the Roadster features an extendable rear spoiler. This reduces lift at the rear axle at higher speeds. With its broad shoulders and expressive tail light graphics, the rear end enhances the emotional overall appearance. The interior design echoes the design lines of the exterior. The dashboard places a firm emphasis on width, creating an impression of a powerful wing. Thanks to the high beltlines, concave door paneling, a dynamic, rising center console and the low seating position, the driver is integrated into the cockpit and feels fully attuned to the Roadster. The sports seats, the Performance steering wheel and the instrument cluster also demonstrate outstanding precision and high-quality materials. The sport seats are upholstered in black ARTICO man-made leather/DINAMICA microfibre as standard. Numerous other materials and colors are also optionally available. As standard, the AMG GT S Roadster comes with the AMG Silver Chrome Interior package. This creates particular highlights with trim in high-quality silver chrome. The package consists of a center console surround, air vent bezels and trim strips in the door armrests in silver chrome. The AMG Piano Lacquer Interior package is available as an option. Trim surfaced in luxurious, shining piano lacquer accentuates the high quality of the interior. The package consists of a center console surround, air vent bezels and trim strips in the door armrests in piano lacquer look. Also optionally available are AMG trim elements in matt silver glass-fiber, carbon-fiber and matt carbon-fiber. The Exclusive Trim package further enhances the AMG trim and brings even more individuality to the interior. It consists of two trim strips in the door armrests in a version dependent on the chosen AMG trim. The optionally available AMG Performance seats provide even more lateral support with more heavily contoured backrest and seat cushion side bolsters. The AMG Performance seats of the Roadster are also optionally available with the AIRSCARF neck-level heating system, which makes open-air driving enjoyable even in low outside temperatures. AIRSCARF is likewise optionally available for the standard-fit AMG sports seats. The air vent is seamlessly integrated into the seat’s head restraint area. To meet the individual preferences of customers, the temperature of the warm airflow can be set in three stages. Customers wishing to enjoy comfortable temperatures even on very hot summer days can also opt for the seat climate control, which is also available for the AMG Performance seats. The intensity of the climatization can be set in three stages. As standard, the Mercedes-AMG GT S Roadster is fitted with 10-spoke light-alloy wheels painted in vanadium silver, with 9 x 19 inches (front) and 11 x 19 inches (rear) and tyre sizes 255/35 R 19 and 295/35 R 19 respectively. A host of different design and colour variants are also available as optional equipment, e.g. ultralight forged wheels in a cross-spoke design painted in matt black with high-sheen rim flange or in polished titanium grey, both with fully integrated wheel bolt covers. Also new are 5-twin-spoke light-alloy wheels panted in titanium grey with a high-sheen finish or in matt black with a high-sheen finish, with mixed tyres 265/35 R 19 on 9 J x 19 (front) and 295/30 R 20 on 11 J x 20 (rear). On the basis of the extensive standard equipment, the Mercedes-AMG GT S Roadster offers wide scope for individual wishes. The AMG DYNAMIC PLUS package ensures even higher driving dynamics and even sportier handling characteristics. In addition to dynamic engine and transmission mounts, it includes a more stiffly set-up sport suspension, a specific steering setup and a specific engine application. As an option, the AMG rear axle steering can be ordered in conjunction with the AMG DYNAMIC PLUS package. 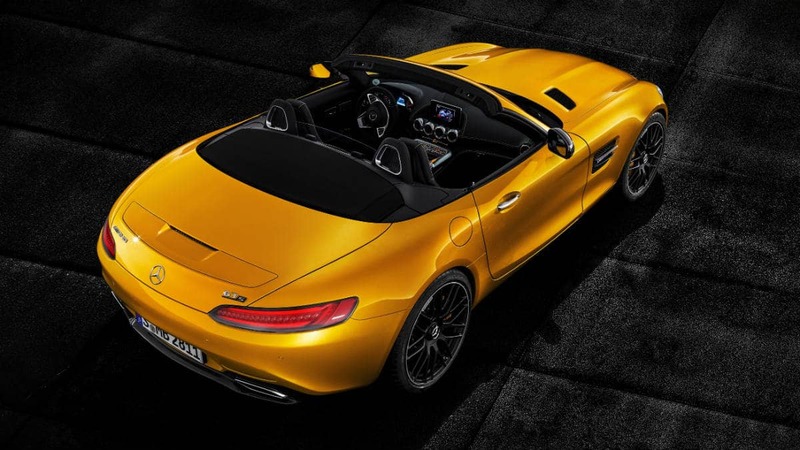 This makes the AMG GT S Roadster even more agile, with even greater handling stability at the limits. The intelligent principle: Contrary to steering in the lower speed range and same-direction steering at higher speeds act like a shorter or longer wheelbase. The AMG Exterior Carbon-Fibre package lends more dynamism to the open two-seater from any angle. In this case, the front splitter, exterior mirror housings and the diffuser in the rear apron are in the motorsport material carbon-fiber. Moreover, the air inlet grilles in the front apron are in high-gloss black, as are the air outlet grilles on the bonnet and the air outlet grilles behind the front wings, which also have carbon-fiber fins. With the AMG Exterior Night package, numerous features in high-gloss black enhance the expressiveness and sportiness of the Roadster: the front splitter, fins in the air inlet grilles in the front apron, the air outlet grilles on the bonnet, the air outlet grilles with fins behind the front wings, the exterior mirror housings, the trim strip in the diffuser insert and the two exhaust tailpipes are painted in high-gloss black. The high-gloss chrome features in the AMG Chrome package include the front splitter, the fin on the air inlet grilles in the front apron, the fins in the wings and the trim strip in the diffuser.